Remember when you were younger, playing youth sports like soccer or tee-ball, and one of the moms would bring a bunch of orange wedges for halftime or after the game? Well, fast forward about 20 years or so. I now find myself playing on an adult kickball league (yes, I said kickball), and instead of orange wedges, I bring orange peel jello shots. Hey, we’re all still kids at heart, right? Making jello shots in fruit peels is nothing new on e is for eat. I made Lemon Meringue and Arnold Palmer jello shots in lemon peels. I made Ruby Red Greyhound jello shots in grapefruit peels. I’ve also made orange creamsicle jello shots in orange peels on my own before, but I wanted to step it up a notch for the blog. As you might have noticed, I’m sort of obsessed with blood oranges at the moment. (The citrus salsa, the blood orange mojitos and margaritas in Arizona). And if you’ve read the blog from the beginning, you know that I’m also partial to champagne. 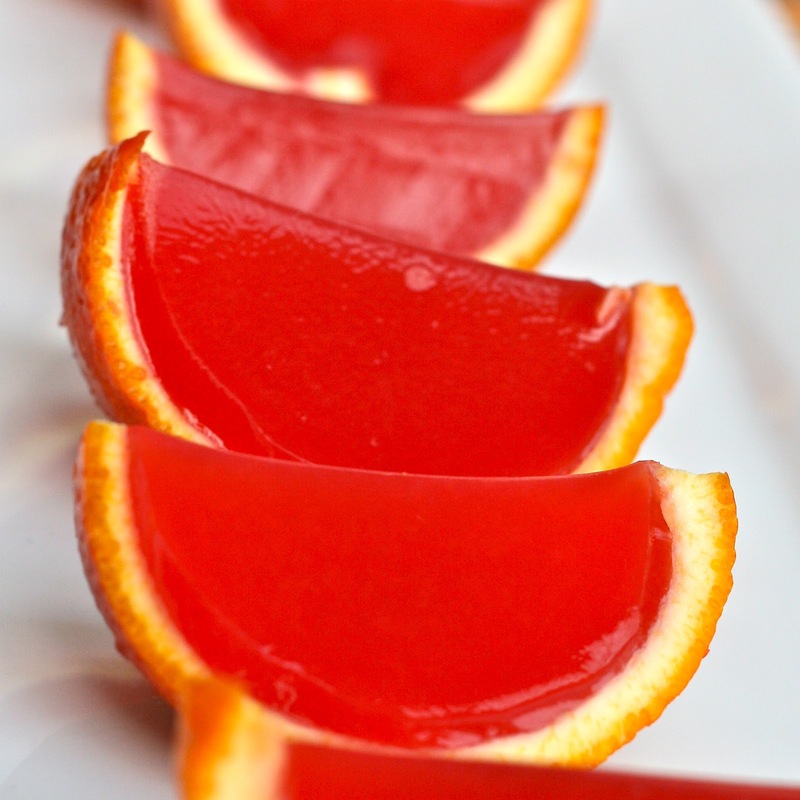 Enter the blood orange mimosa jello shots! As with the other fruit peel shots, you need to make a “cup” to hold the jello while it sets. To do this, cut the orange in half and carefully remove the fruit portion using a paring knife, grapefruit knife, or just your fingers. I discovered about halfway through that it’s better to cut the orange with the navel on the cut line instead of on the bottom. The reason for this is sometimes the navel has a tendency to make a little hole in your cup, which pretty much renders them useless. With them on the side, it won’t matter. (For some reason, the fruit came out easier as well). I wanted to use this precious blood orange juice for the base of my shots, so I squeezed out as much juice as I could from the removed sections. With 5 oranges, this only produced about a half cup of juice so I had to add regular orange juice to make it equal a cup. (Next time, I would buy extra oranges so I could use all blood orange juice). Strain the juice to remove any pulp or seeds and place in a small saucepan. Sprinkle with 2 packets of Knox unflavored gelatin and a tablespoon of sugar and let soak in for a minute or two. Heat on medium until everything is dissolved. *Note: If you aren’t using the Sophia cans, just measure about ¾ cup of champagne and ¼ cup of Grand Marnier. Place hollowed out orange halves into a muffin tin to help keep them secure in the fridge. Stir champagne mixture into the gelatin mixture and pour into orange halves. (Also, as some readers have noted in the comments section, slightly flat champagne works best, or you can wait until the bubbles subside before pouring into oranges.) Allow to set at least 4 hours or overnight (preferred). Slice oranges in half and carefully remove the fruit portion to make orange peel “cups.” You will need approximately 10 halves (5 oranges) to hold all of the jello. Strain juice to remove solids and place in a small saucepan. Sprinkle with gelatin and sugar and allow gelatin to soak for a minute or two. Heat over medium, stirring until the sugar and gelatin are both dissolved. Stir in champagne and Grand Marnier and pour into orange halves that have been secured in a muffin tin. Allow to set several hours or overnight. Slice into wedges and serve! Such a fun idea! I can't wait to try! Awesome! I will try it this weekend. Let me know when you guys try and how they turned out! This is great Jaymee ! That looks amazing, will definitely try this summer! I just made these, and they came out wonderful! They are just adorable. A note on the quantity that the jello makes according to this recipe- I added all the liquid as directed above- and it did not fill 10 orange halves. It filled around 5 and I had to make another batch. I also added edible glitter into the liquid to give it a unique touch. They are very shimmery and pretty! Thanks for the recipe! The champagne decarbonated rather spectacularly when I added it to the hot mixture (duh! ), leaving a large foamy head to deal with. Next time I'll try cooling the gelatine mixture to something like room temperature before adding the champagne. in my experience, best to let the champagne go flat first. either let sit out overnight, or pour back and forth between cups until no more carbonation. Thanks for the feedback...I updated in the post. Oh that looks so delicious. I want to try that right away. My kids will surely enjoy them. I've worked in the bar/nightlife industry for almost 15 years now and haven't heard of such a thing! Trying it tonight!